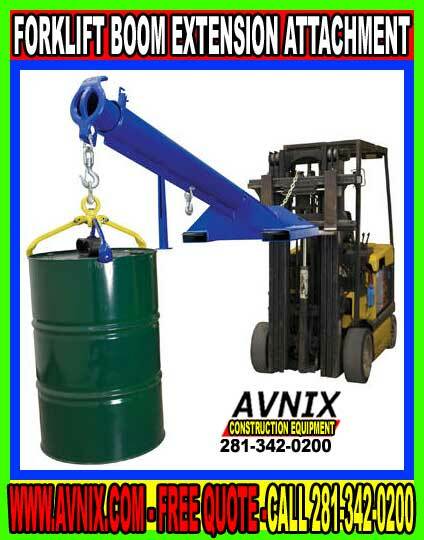 Forklift Boom Attachment – Call Us For A Free Quote 281-342-0200! Forklift Boom Extension Attachment Call Us For A Free Quote! 281-342-0200!Forklift boom attachment offers exceptional performance, ease of use and safety features are built into every forklift boom extension attachment. Made from structural steel with welding to meet American Welding Society creates a rugged and long lasting forklift boom that will outlast your forklift Telescopic booms come with an adjustable locking screw (except orbit booms which features a locking detent). Fork pockets for 3,000 and 4,000 pound capacity models measure 7½”W x 2½”H usable. Usable fork pockets are 7¼”W x 2¼”H for 6,000 and 8,000 pound uniform capacity models. 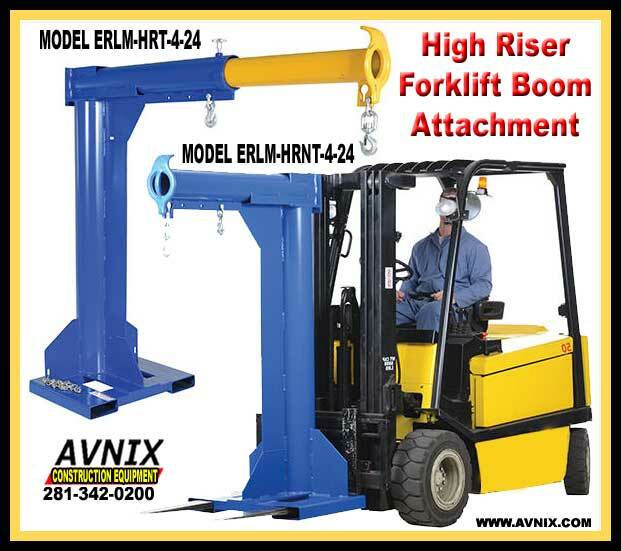 A 36″ safety restraint secures the boom attachment to the fork truck for safe operation. 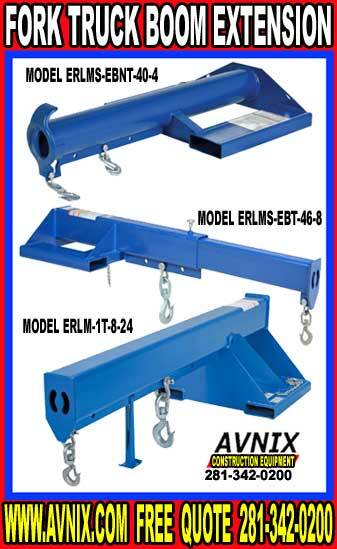 Each boom model includes two lifting hooks. Most forklifts are designed for lifting and moving pallets about. 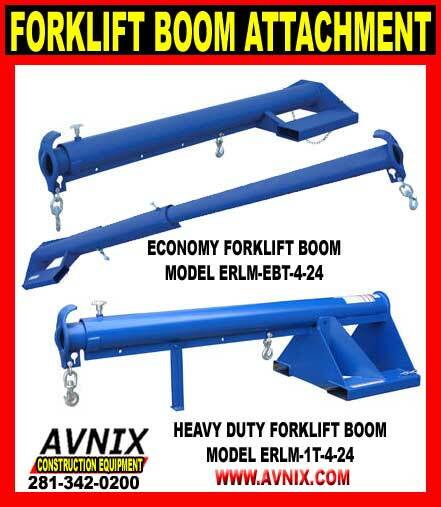 Boom extensions are used to give the forklift more span and more muscle for heavier loads. Yet, a forklift can do more than just lift and move pallets around. By using one of the many forklift booms available, you can use the forklift for more specific jobs. Operators of forklifts have to go through a training course. This is designed to ensure that the operator can safely operate the forklift to prevent injury to the operator as well as those working in the vicinity. Forklifts are dangerous and all should understand and comply with all safety procedures. For employees that will be working with forklift booms must be given additional education to make certain they know how to safely use forklift boom attachments. Accidents have happened from failure to safely operate a boom during the work day. There are quite a few companies that offer training classes on all types of forklift booms. Some businesses offer on-site training where workers can all be trained on the site where they will be working. This gives the trainer a chance to address all safety concerns that the job site will present. 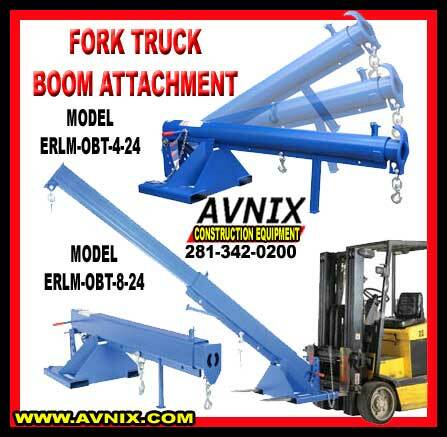 Fork Truck Boom Attachment Call Us For A Free Quote! 281-342-0200! Model Description Fork Pocket Center Overall Extended Length Height Uniform Capacity (lbs) Wt.